HUBBA HUBBA- HONDA'S HUBLESS MACHINE! Well, who would of thought you would see a Honda like this, but to be honest, I really dig it. Last week, Honda unveiled its retro-modern Honda hubless electric motorcycle. The features of the retro design reflect modern standards with Electronic Twist Throttle, Electronic Twist Brakes, and Dual MagDrive Wheels. The CB160 has a top speed of 100 mph and a range of 160 miles. So, with Modern technology and a little of yesteryear sprinkled in, you may well see one of these whispering past you as you shop in Target on a Sunday. Be fun to run around the business park here, or as a pit bike etc. So keep your eyes out at the new Concept shows as something is bound to come out with a look similar to this. Below is Harleys 2020 Concept, Looks like they have seen the Honda! 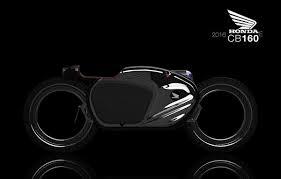 This entry was posted in Blog and tagged 59 club, cafe racer, CB160E, classic, Concept bike, Custom built, Futuristic machine, Honda Motorcycles, Hubless motorcycle, space age, ton up.